 A plan for an overwhelming rush (releasing blockers, quick passes, pitches).  A plan for a team that doesn't rush (QB sneaks, two-move routes).  A dominant defense (zone or man, blitzes, audibles).  A plan to handle a fast, shifty QB (extra rushers, etc.).  Don't wait flat-footed: If you wait for the ball carrier to pass at full speed while you flail and swipe at the flags, you are setting yourself up for disaster. Instead, meet the ball carrier as early as possible, and move with the ball carrier while you pull the flags. 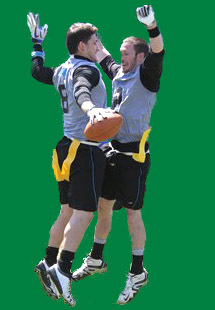  Get in the way: Most flag leagues do not allow (much) contact. That is why it can be especially helpful to stand in the way of the ball carrier while trying to pull the flag. They can't bull you over; they have to go around. 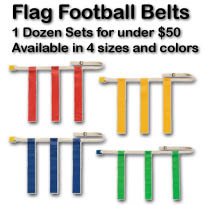 This slows them down and gives you more time to pull the flag.  Pursuit: If everyone on your team pursues the play, you will win more games. You'll have fewer breakaways because if one guy misses the flag, another is right there. © 2014. This site was designed and developed by Chris Beeman and has been servicing Flag Football coaches and teams across the world since 1997.